Cultural Compulsive Disorder: This Avengers Fan Made Poster Is Even Better Than The Official Studio Ones!!! This Avengers Fan Made Poster Is Even Better Than The Official Studio Ones!!! Fan made posters are nothing new. Artists are constantly putting their own spin on movie & TV properties in order to express their own creative minds on familiar topics. But once in a blue an artist comes through with such an amazing piece of work that it eclipses the original promotional material. Case in point: NinjaInk's take on The Avengers movie poster. Wow... this is a must see. 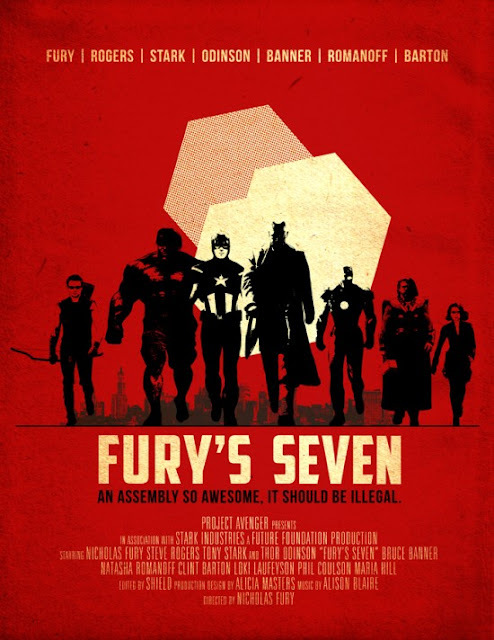 Click here to see more of NinjaInk's work & click after the jump to see his awesome Fury's Seven poster!!! THAT IS AWESOME. The tagline is my favorite and using a different name for the movie makes it more realistic. No one would really call them "The Avengers." This made it to a shirt on http://riptapparel.com/!